My earrings for Weeks 9 and 10 of Art Jewelry Elements’ Earring Challenge feature wavy discs, combining several different metallic tones from my growing collection. Large sterling silver discs serve as a backdrop for a highly textured bronze disc and silver flower bead by Tamara Scott Designs. Freshwater pearls and round sterling earwires keep these simple and classic. Layered neutrals perfect for spring! 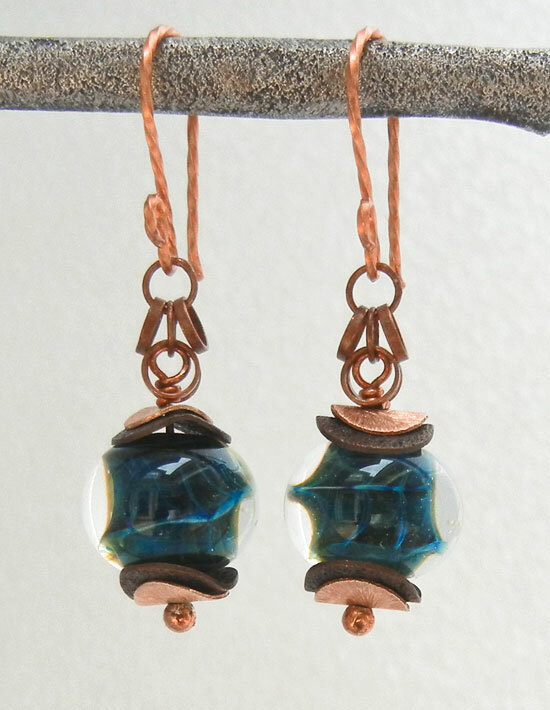 Plump blue-green lampwork beads by Kimberly Branch are bracketed by wavy discs in dark bronze and rose gold. A bit of copper chain, along with fancy copper head pins and earwires complete this design. 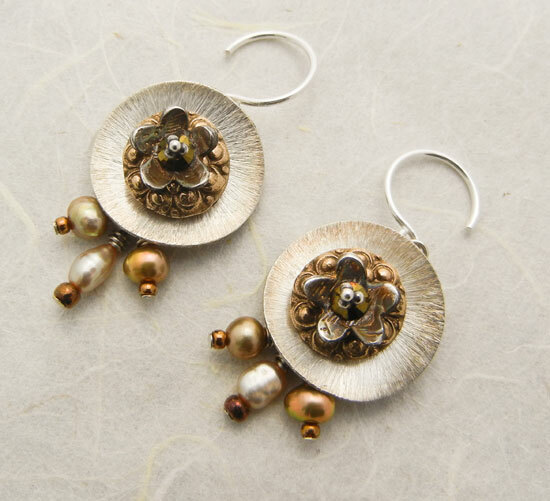 Click over to the Art Jewelry Elements blog, just the place to find lots of Spring color inspiration. Love the all the wavy discs and the different textures together, very nice! Great earrings, I especially like the first pair!! Love them both, but especially the first pair - dynamite design! Thanks, Lesley! The large silver discs in the first pair came from your store! Wow - love them. Especially the first one! Great earrings! I’m part of the bead soup party. Looking forward to the reveals. I'm now following you. I have a new blog. Please consider following my jewelry blog. Thanks. You can choose a gold diamond bracelet for a lady of any age to commemorate an event. Younger women will cherish the bracelet forever. Older women may pass the bracelet down to loved ones once they are gone. One thing is for sure: the bracelet that you choose pet houses will be cherished for many years to come.